The LGBTQ+ community has been grappling with Sunday's terrifying news that the Trump administration plans to "define 'transgender' out of existence." People are scared, angry, depressed. But good news! Should you wish to express LGBTQ pride, there's plenty of merch you can buy. Right on Trump's website! That's right. 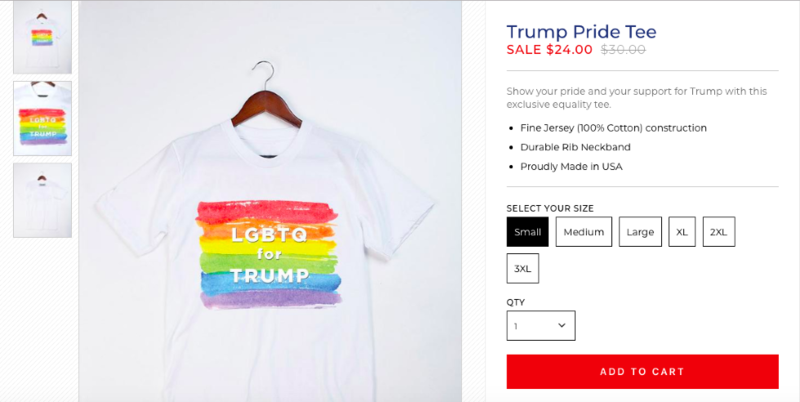 This administration is so shameless that even after huge news breaks that they plan to violate the civil rights of transgender, non-binary, and gender non-conforming Americans, they're still selling Pride merch. A "Trump Pride Tee," to be specific. Here's a screenshot taken at 11:05 AM on Tuesday, October 23rd, just in case. Note that the tee is on sale for $24, down from $30. Hey, at least it's size-inclusive? Proceeds from the Trump Pride Tee, like all of the merchandise on Shop.DonaldJTrump.com, will go towards Trump's 2020 campaign.